We had crabs last night. Black pepper crabs .. totally yummy but as I was at a work dinner, and wearing some rather nice threads, I decided that I would be ladylike and hack daintily at the crab legs with my fork & knife instead of mauling them with my fingers & teeth. We had a company dinner at The Mezzanine at the Hyatt Hotel. Always a great spot for food but I could tell that our artist was a little uncomfortable. Being a fairly simple bloke from China, I think he felt the place was too posh for him. What was worse was the new colleague we hired - another mainland Chinese import. Perhaps her nerves got to her or she was too eager to make an impression that she made a great many gaffes at the dinner table. Actually, she was pretty full on even on the ride to the hotel. So much so, the boss got highly irritated at her and told me to tell her off and to stop her from flirting inappropriately with the artist. Terribly awkward that. 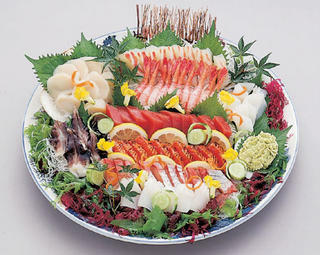 Anyway, we had the most amazing sashimi platter ... everything was so fresh, I almost thought the sweet ebi might make a run for it and try to swim away. I loved the sashimi platter but we were hard pressed to finish the entire platter as three of our dinner companions were either allergic to or in fear of the lovely little morsels of raw seafood. This was followed by the black pepper crabs. Very succulent and tasty but I reckoned that the No-Sign Board and Jumbo places were better - mebbe it was lack of tactile and slobbering enjoyment that threw me. LOL. The mixed grill was excellent. By now, I knew I was incapable of eating anything anymore but valiantly, I ate a slice of steak. Medium rare, tender and of an excellent cut, it was ambrosia laced in Bernaise sauce. The single lamb chop I ate was unfortunately cold ... never a good thing and therefore, the taste was highly compromised. Still, I could tell that it would have been very delicious if it was really fresh off the grill. Perhaps, I waited so long to eat it that it went lukewarm on me. Oh well. Finally, and thank God I was too bloody stuffed to eat it ... the beef fried noodles. I had totally given up by now but everyone who ate it refused to eat it again. Apparently the noodles were strange tasting - "too starchy", according to one erudite colleague and "taste funny funny one" was the verdict from another eloquent critic. We returned it forthwith and Hyatt showed why it was a top hotel when they cancelled the order and offered to give us either a replacement or dessert compliment of the restaurant. We declined and were very appreciative of their gesture anyway. Now that is good service even if their beef noodles sucked. Which brings me to the point - why top restaurants would spend a fortune and immense time crafting complex and gourmet menus and neglect the really simple, basic things. Ruining beef noodles that any neighbourhood hawker centre can deliver is inexcusable. I think the Hyatt sous chef and F&B Director should wake up and smell the yeast. Because while we thoroughly enjoyed the rest of the food and the service, the dinner was ruined by the disappointment that they have lost the plot. P/S. Not my photo and can't remember the source so if it is yours, do let me know and I will add the proper attribution. Blah to so-called posh restaurants that spoil beef friggin' noodles; they're the sorts that would probably burn mac'n'cheese if they had to make it for someone. I'm willing to bet the chef(s) didn't taste-test the dish before it went out to the table. Horrible, horrible, just no excuse at all; I wager they probably got cocky. When we go to Comicon next year, let's grab some grabs and do like cavemen .. oops ... cavewomen ... LOL. I'll make chilli crabs! And steamed with butter and garlic. Yesssss. can't believe you went to mezzanine for beef noodles. should have spared stomach space and calories for something more 'atas' lah. Hey, don't look at me! The Office Manager probably thought that it would make the Chinese artist feel more at home. Apparently, he'd been craving his soya beancurd and you tiao etc since he's been in Singapore and I reckon she wanted to make him feel as at home as possible.